Design is worked in one piece. Information on how to adjust size is also included. The design is written in English with standard U.S. terminology and based on a stitch pattern for a pillow design I made in the 1960s (Avalon Pillow Pattern available here - https://www.etsy.com/listing/535939165/crochet-pillow-pattern-avalon-pillow). 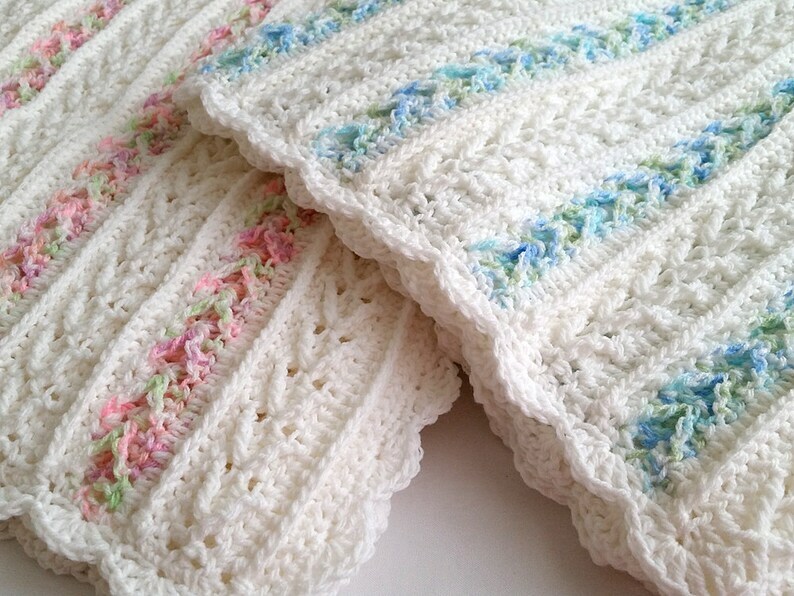 The Avalon Baby Blanket crochet pattern includes a list of materials needed, crochet abbreviations for the stitches used, plus full instructions on how to crochet each row and includes two different edgings. This crochet pattern is considered a Beginner to Intermediate Skill Level pattern. An understanding of basic crochet stitching is required. The pattern comes in Adobe Reader format (.pdf). Gorgeous pattern. Can’t wait to work it up. Speedy service. This is a beautiful pattern and the seller was very quick to answer any questions.